Ah selling and marketing! 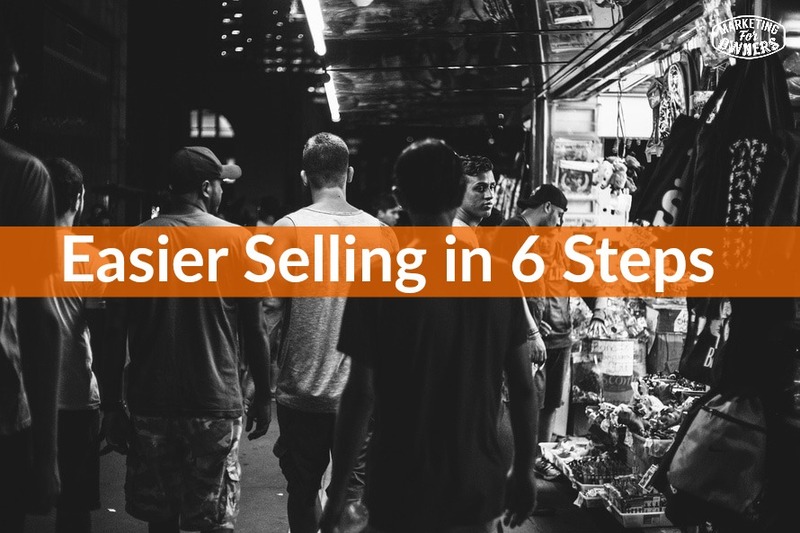 Now, if marketing is done correctly, you shouldn’t require sales people. By the time you get to the customer, they are presold. Although I call it selling, personally I think it is marketing. So, grab your pad and your pen and your piece of paper and we will get started. By the way, if you want to access all of our other weekend challenges, simply visit marketingforowners.com/challenge. If you are trying to market or sell to the general public, you will fail miserably. You will waste your time and money and advertising space. You will waste effort and you will waste energy. For example — If you sell ladders, there is a section of the populous that is not interested. Firstly, there is going to be people outside of your country if you don’t ship internationally. If you only deliver locally, there are going to be people outside of your range, and then people within your range who are not going to need ladders. If you sell fiberglass ladders, then you are probably trying to sell to electricians. You are probably not trying to sell to general construction sites. That is a target audience so you need to know how to get in front of those and only market your fiberglass ladders to electricians and whoever else may use them, not to the people outside of your range and who does not use fiberglass ladders. When you are trying to market your product or service, more often than not, your customers don’t know that they have a problem. They have a problem, which means they need your product, but they are not quite sure what it is and they have not put it into terms in their mind. You need to do it for them. The iphone for example — is another one that is a product that no one needs. These companies had to convince people that they had a problem that their products solved. So for example, the Dyson fan I mentioned above. Before the bladeless fan came out, they had big and small ones that had fan blades. Up to that point, everyone was happy. If you need a fan, you just went and got one with no problem. Then Dyson comes along and explains to us the reason why we need the other fans. For instance, you can get your hair caught in the blades, kids stick their fingers through and they get chopped off, it is not efficient enough in blowing air all over the room — it only blows in one place unless it is oscillating, etc. They had to tell people that they had a problem with the fans. The Dyson fan I mentioned above, the team went into stores and tried to find a fan that didn’t just blow straight into your face, but it did not exist. It just was not there. Remind your customers or potential customers of how they have tried to fix it and how it has not worked. If your James Dyson, how you looked at it and fixed the problem and look what it has done for you. This is how your life improved and it is wonderful. This is how you found the solution and how it came about. It is just a wonderful thing. You have to tell people about that. In step 4, you explained to them how you find the solution, how it improved everything and made everything better, now you have to explain how this will help them. They are only interested in whats in it for them. They don’t care about you or what’s in it for you, just how it helps them so put it into perspective into their words. This is all benefits, benefits, benefits, not features, but benefits. So everything from here on out is in relation to them and tells how it is going to help them and benefit them. Buy now. Add to Cart. Get Yours Now. Or, if it is a special offer, “sign up before”, “register before”. It may even be “grab your download now”. You get it. But you need to tell them what to do. This is a call to action and this is the point that most people miss. They get nervous about what is called “closing the sale”. You are just telling them what they need to do. If they have read this far or listened this far, then they are interested. Tell them what to do. It’s as simple as that. This can be applied in a print offer, in an advert, a letter, an email, a web sales page, in a presentation person to person. 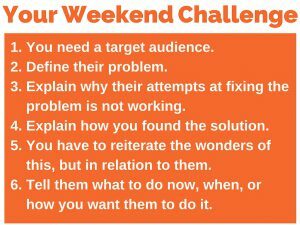 Break it down, make a template, and write those steps and fill it all in. It will improve your sale dramatically because you now have a format and a structure and a system and it will work. 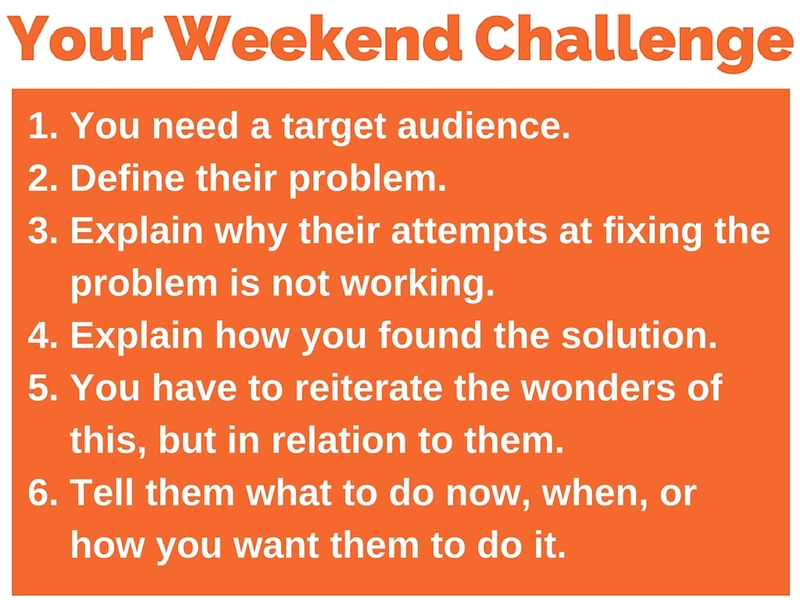 This is your weekend challenge. I’ll see you back on Monday.